Wheelersburg senior Tanner Holden receives his SOC II player of the year plaque. Notre Dame senior Katie Dettwiller receives her SOC I player of the year plaque. 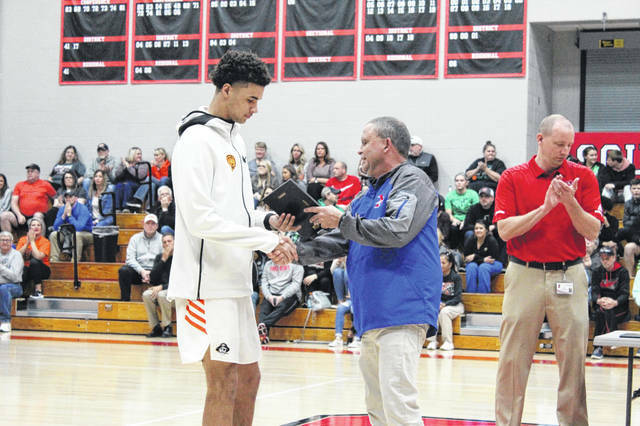 SOUTH WEBSTER – Tuesday evening, representatives from all sixteen schools in the Southern Ohio Conference (SOC) at South Webster High School to honor the all-conference members from each school, as well as play the SOC I and II boys’ and girls’ all-star games. To kick the event off at 6:00 p.m., the SOC I and SOC II girls’ all-star game took place. At halftime, SOC I held a 33-27 lead over the SOC II. By game’s end, SOC I stretched out their lead to 11 points to take home the 57-46 all-star game win for the smaller schools division. 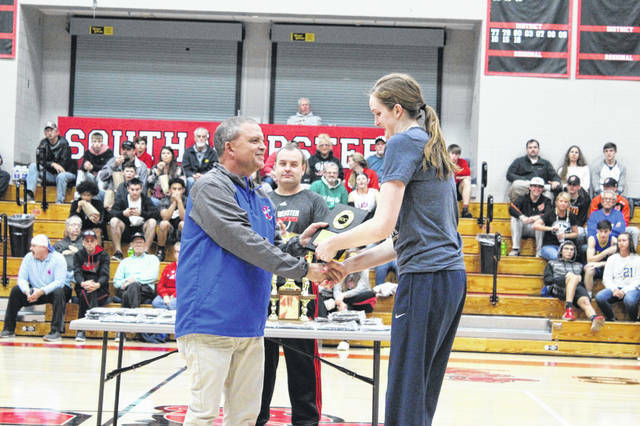 Dettwiller scored a game high 21 points in the smaller schools win, and afterwards received her SOC I player of the year trophy. Following the conclusion of the girls’ all-star game, the three point contest between each school took place. One boy and girl representative from each SOC school picked their favorite spot on the three point line and whichever team of kids’ from the same school made the most in 30 seconds would walk away three point contest champions. It just so happened that the first competitors who shot, Wheelersburg’s Trent Salyers and Abbie Kallner, would walk away victorious with 17 made three pointers combined. Once the three point competition was finished, it was time for the awards presentation. Members from the SOC I and SOC II all-conference teams for both boys’ and girls’ basketball received their plaques, and the SOC I and II champions for boys’ and girls’ basketball received their gold ball trophies. In the SOC I, Notre Dame took home the gold ball in girls’ basketball while the Eastern Eagles took home the gold ball in boys’ basketball. In SOC II, it was a clean sweep for the Wheelersburg Pirates as the took home gold ball trophies in both boys’ and girls’ basketball with a stellar 27-1 combined conference record for the 2018-19 season. In the boys’ all-star game which followed the awards presentation, there were plenty of threes made and plenty of dunks to be had. After starting off the game up 12-0, the SOC II bunch actually fell behind 42-37 to the SOC I at halftime. “It felt great to represent my school and show what the Tigers are made of,” said New Boston senior Tyler Caldwell on what it meant to represent his school and the SOC I in the all-star game. Even though they tried their best to complete the comeback and force overtime or hit the game winning shot, it was ultimately the SOC I that walked away with the win 87-85 over the SOC II. The best pictures from the SOC all-star game event can be found at: https://www.facebook.com/PDTsports/.